Being cooped up in a truck all day is a quick way to get on anybody’s nerves. To stay sane and happy, one can’t keep ruminating over problems at home or trying to solve the world’s crises in one’s head, all while trying to dodge that jerk that–holy cow, did you see what that a**hole just did? Jiminy Cricket! People don’t know how to merge in the fargin’ merge lane. Whoa, Nelly! Watch what you’re doin’ you, you, you…. Gaaah! Instead of trying to figure out new and interesting anatomical terms to apply to the idiot drivers around me, I find it is helpful to reflect upon and enjoy the little experiences that happen throughout the week. For the last several days, from New York, through Pennsylvania, Ohio, Indiana, Illinois and Iowa I have been enjoying a wonderful evening light show absolutely free and courtesy of the mid-west’s lightning bugs. 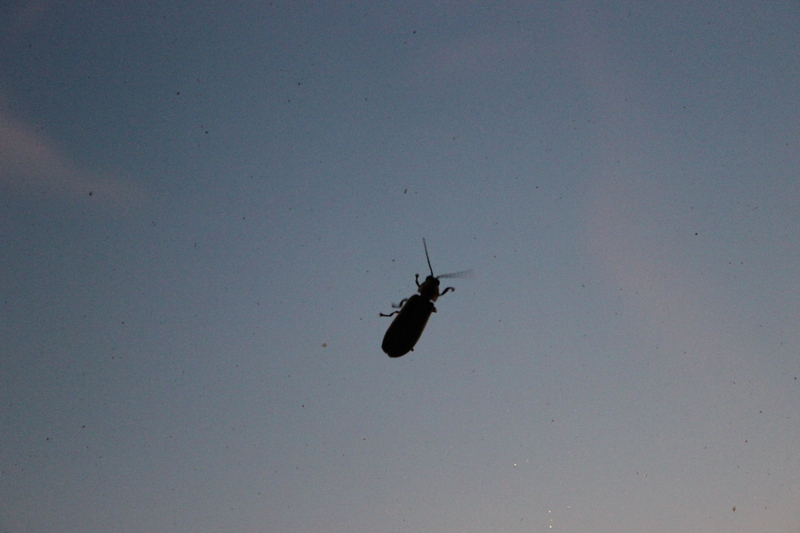 Back in Oregon, we don’t have lightning bugs. So I find these insects to be charming creatures. And much to my delight, when they smash and splatter against the windshield when my truck is going 62 mph down the freeway, their bio-luminescence continues on. Death by splat does not equal no more glow. In fact, the glow is now spread over at least an inch square on my windshield and it lasts an incredibly long time. Even more delightful, when I was in Maquoketa, IA, I actually caught one of the bugs!! You see, since I wasn’t born out on the east coast or in the mid-west, my childhood was deprived of that ritual of filling glass jars with the insects and poking holes in lids for them and making lightning bug lanterns. So you can imagine my excitement when I got to experience an important missing part of childhood. Well, my grown-up inept version, anyway. As I was hanging around in a Walmart parking lot waiting for my appointment time (my appointment wasn’t at Walmart, but it was a great place to park, since I was able to re-supply there and get more much-needed groceries). As day turned into dusk, the nightscape lit up with these guys doing their crazy flying dances. I got out of the truck and attempted to take some photos, but unfortunately, I could never get them to coordinate their dance for me so that I could get most of them going off at the same time. Every time there was a big coordinated burst of light, I always was either fiddling with my camera or otherwise too slow to catch it. Darn uncooperative little boogers. Teases. There were literally hundreds of them flying around, and all I could ever get on camera was one or two flashes at a time. But one was pretty friendly, at least. This lightning bug decided to pay me a visit and flew into my truck when I got back in after giving up my quest for The Great Lightning Bug Photo. 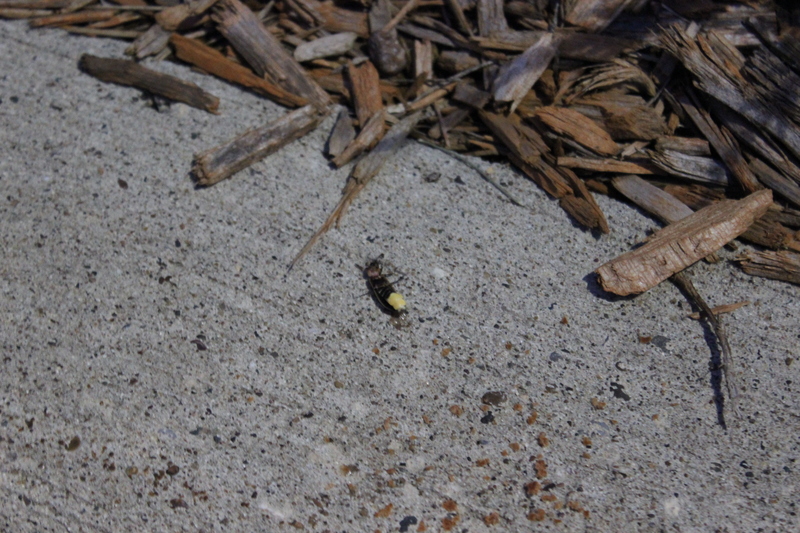 Well, hello, little lightning bug! I immediately went in search of some sort of jar that I could catch him in. After all, I didn’t want to catch him with my bare hands, and then accidentally squish him and then have that glowy gut crap on me. Ew. Darn. No jars. The only thing I had remotely container shaped that I could grab real quick-like was an empty can out of my trash can that formerly contained refried beans. I grabbed it, put it over the bug and used a paper towel to cover it. Then I peeked in. 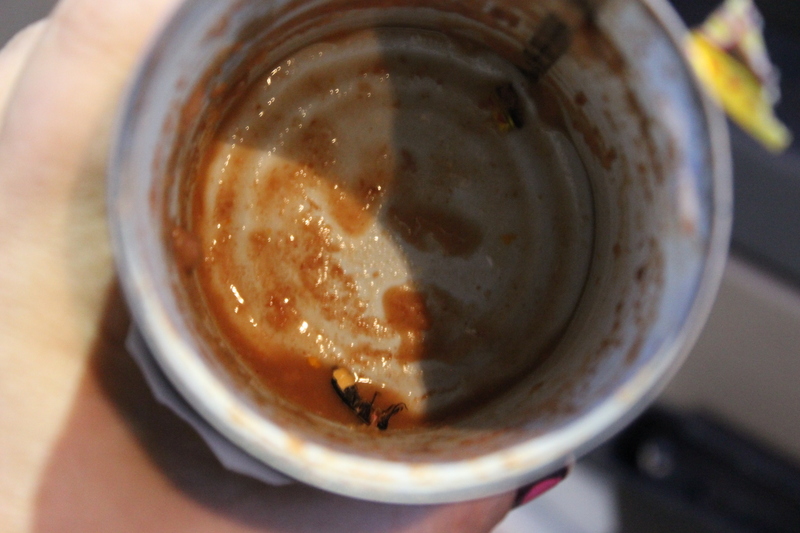 In my haste, I forgot that the can still had bean juice in it. The poor bug got thoroughly soaked in bean gunk. And he was stuck to the bottom on his back! I immediately felt guilty. So I took the can outside and dumped it out on the curb next to the truck. Poor bug. He just lay there for a while and I was afraid I had killed him. Then, he apparently got his little legs working properly, because he managed to flip over and waddled away. Note I said waddled. 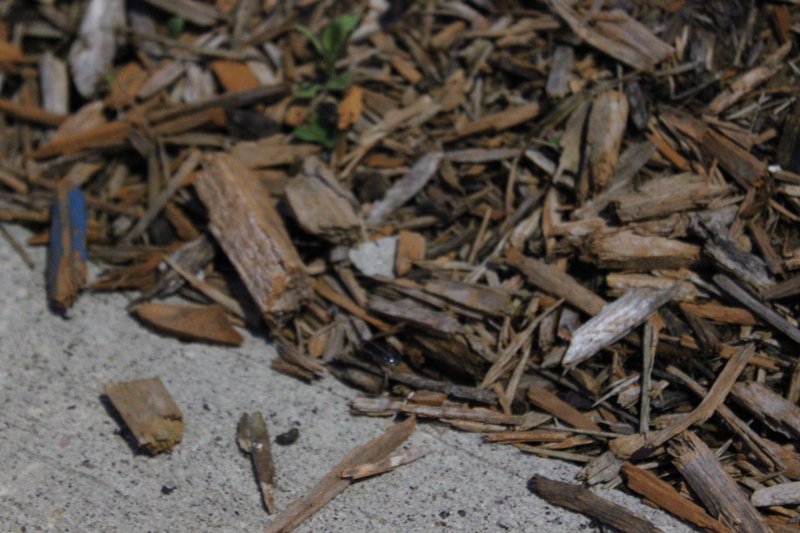 He disappeared into the bark dust and I never saw him fly. I hope his wings didn’t get ruined. I wonder how many lightning bugs’ lives have been ruined by humanity’s fascination with living lightbulbs? Oh, shoot, now I’m getting into negativity. 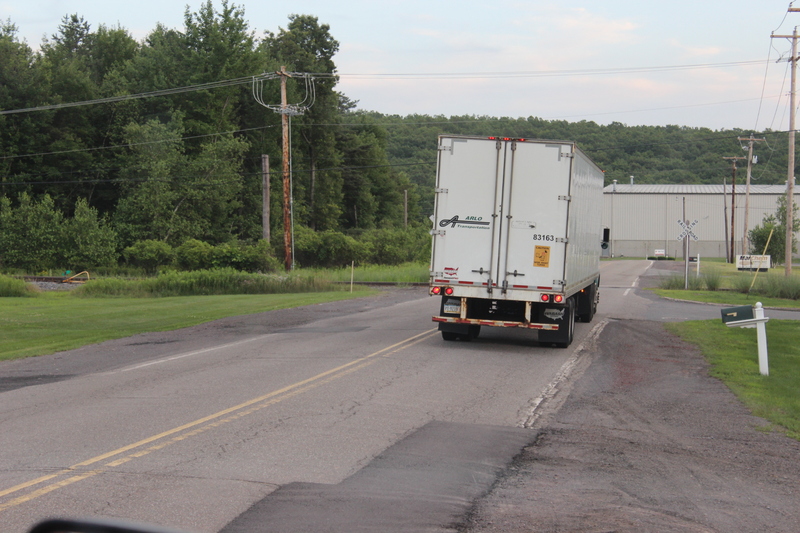 A couple of days ago when I was picking up a load in Mountain Top, PA, I was parked at the side of the road waiting for my appointment. Lo and behold, not 150 feet in front of my truck a mama deer and her little adorable spotted fawn passed right in front of me! They crossed the road and then hung around on the lawn of this business across the street from me, but a bit farther away. The little fawn, being like all young animals, liked to play. He started tearing back and forth on that lawn and kicking up his heels. I tried to get my camera into the video mode, but for some reason couldn’t make it do it this time. I only managed to get a few pictures of them even farther away, which was a bummer. But it was fun to watch the little fawn playing. He even got mama dear in on the act and she even kicked up her heels a few times, though unlike the fawn, she didn’t go tearing around like her tail was on fire. How can one NOT enjoy a scene like that? Another trucker happened to come up the street and saw these deer and their antics and she pulled up almost directly across from them and was taking pictures or video on her cellphone. 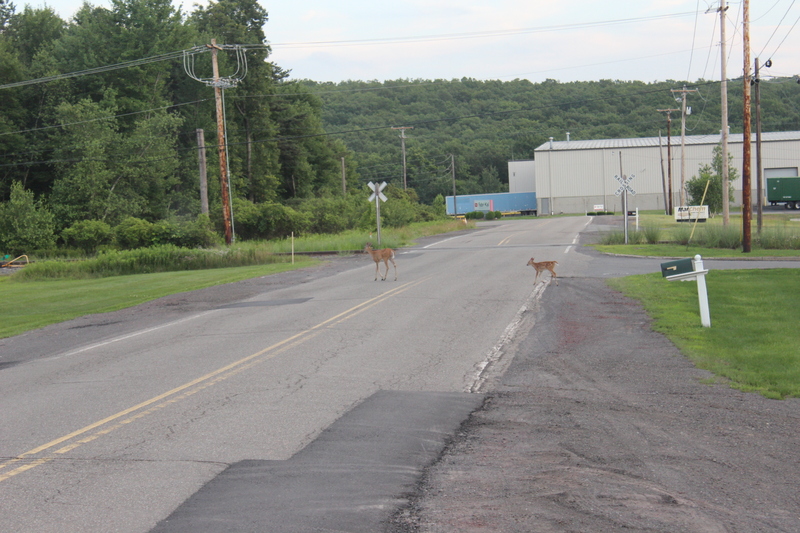 Eventually, the deer didn’t like how close her truck was parked to them in the middle of the road there, and so they continued away from me until they were quite out of sight. The driver was just sitting here, parked in the middle of the road for a good three minutes, watching the antics of the deer. Luckily, nobody else came by. Another week or so ago I actually saw a bobcat at the side of the freeway off of I-84 in Oregon. I’ve only seen a bobcat once before in my life. So that was a treat! I felt blessed by the kitty’s presence. So, when I’m feeling like the crazy drivers and horrible traffic are getting the best of me, I take a zen moment and focus on the good stuff. I get to witness so many strange and wonderful things out here, not the least of which is how incredible Mother Nature is. Human nature can be just as great and wonderful to witness, too, but that’s another post for another time. I’m sure this little lesson could probably be applied with a broad brush to the canvas of life in general, but right now, in my here and now, this is where I’m remembering it. The little things are why we are here….. I grinned all the way through the reading! Well, I sure enjoyed and rembered the good ole days when I drove with my husband when we owned our truck. He had a heart attack and I had to learn very quickly to drive, get my licence and go on the road with him and the doggies full time. The little things still stick in my mind like glue and some of the most difficult times of my life, too. I, too, kept a camera closeby and took all kinds of pictures. He drove for 42 years steady, but I was on the road with him for 5 years. We mostly pulled a flatbead and tanker. I really enjoyed it, but I started having health problems myself and had to come off. I enjoyed driving, though and started working for the County transporting mentally challenged adults to work and the more challenged to day school. I adored that too until I got CHF and couldn’t do that anymore. You are right…the little things are why we are here. I laughed all through your post and enjoyed every word;. Take care of yourself. I’ll look forward to seeing you again soon. Why, thank you, Harriet! I’m glad I could make you laugh. Trucking is an interesting job, isn’t it? It is really hard on our bodies and overall health, though. Sounds like you and your hubby experienced that yourselves. That’s partly why I’m so driven to get myself in shape again. I don’t want to end up a statistic.